By Joanne Carew, ITWeb Cape-based contributor. 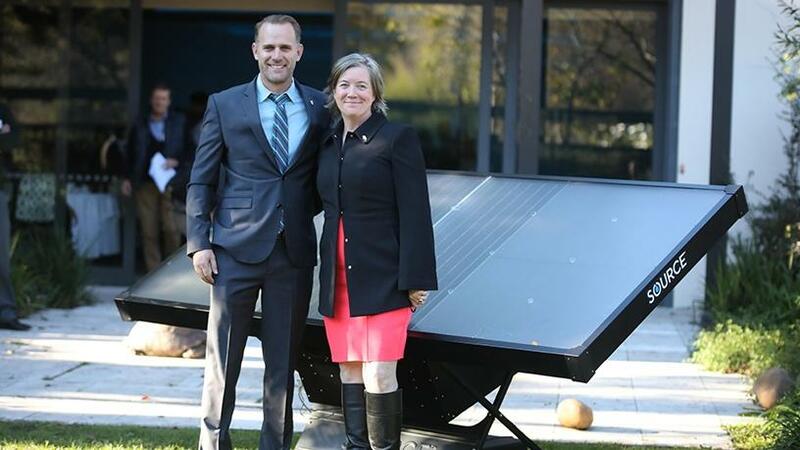 Cody Friesen, Zero Mass Water CEO, and US consul general, Virginia Blaser, in front of an array of SOURCE Hydropanels at the Vineyard Hotel in Cape Town. Zero Mass Water is looking to make drinking water an unlimited resource. The company, already active in countries ranging from India and Australia to Mexico and Jordan, this week added South Africa to that list. Speaking at the official launch of Zero Mass Water in Cape Town on Tuesday, the company's founder and CEO, Cody Friesen, explained he came up with this business idea when he was looking for innovative ways to convert renewable energy into resources. "We still basically live in the Roman Era when it comes to water. We hope for this stuff to fall from the sky or pray to the rain gods. We then wait for it to soak into the ground, pump it, treat it and flow it downhill to our homes. With this in mind, we set out to create a leapfrog technology," he noted. "The most constrained resource we face, around the world, is drinking water. It is probably humanity's greatest challenge." Using his experience in the renewable energy space and background in materials science, he created SOURCE, a solar panel, or "hydropanel", that instead of making electricity produces pure water from sunlight and air. "You set up the panel, the sun comes up and you start making water." Making use of hygroscopic materials, which tend to absorb water from the air under various conditions, they used solar energy to push up the relative humidity in the air, creating condensation. They then harvest this water, filter it and connect it to your tap. "Effectively, we're just distilling the air. Storing solar energy in a glass." The panels are infrastructure-independent and were created in such a way that you can string together as many as you want. A normal family home will need about two, while a school or hotel would require a larger installation. Each panel produces around two to five litres of pure drinking water per day, and has a lifespan of roughly 15 years. From a maintenance and upkeep perspective, Friesen explained that all panels are connected via Amazon Web Services to a central network operating centre so that the Zero Mass team can keep tabs on how each panel is performing in real-time. There is also a SOURCE app that customers can access to track exactly how much water they have available. The app provides a running tally of how many fewer plastic bottles people have purchased by using this system. Friesen believes this is a huge selling point for SOURCE, as users no longer have to buy their drinking water and won't be contributing to the amount of plastic being produced. "Did you know that about a half a trillion litres of bottled water are sold every year? This adds up to a huge amount of plastic and let's not forget the carbon emissions that go into bottling and distributing this bottled water." The applications for this system reach beyond residential and commercial use, he pointed out. "We were actually one of the first potable water suppliers to arrive in Puerto Rico after Hurricane Maria last year. We were able to drop in and install panels to help those folks. Because we can show up, because there is no infrastructure required, we can easily provide potable water in those kinds of disaster situations." On the other end of the spectrum, the system is also being used in the arid Sonoran Desert to provide drinking water for animals, he continued. With the high cost and environmental damage of bottled water, we need a better alternative. "Our system provides a daily supply of delicious, high-quality drinking water while offsetting the carbon footprint of bottled water," he concluded. "With renewable water made on-site, SOURCE offers an infrastructure-free and cost-saving alternative to bottled water, without the hassle or logistics of purchasing and delivering it." The cost for a single panel is roughly R30 000, with a two-panel array recommended for a normal residential home.